It's hard to miss Chicago's orange "glow" during the nighttime—it's an iconic detail of the city that comes with its own chest-thumping pride. 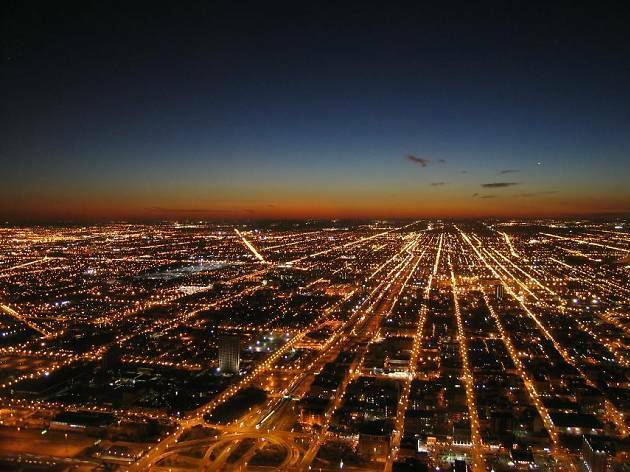 Chicagoans can get strangely excited about the amount of light pollution that pours out of the city, but a new initiative will rid it of its amber hue by the end of the decade. On Monday, Mayor Rahm Emanuel's office announced an update on the Chicago Smart Lighting Project, which will swap out more than 270,000 (or about 85 percent) of the city's outdated high-pressure sodium lamps for LED lights over the next four years—it's set to be one of the biggest municipal lighting programs in the country. The plan was announced last September, but this week the city laid out a timeline for the project that makes the loss of Chicago's amber glow a looming reality. The new LED bulbs will have a more conventional white glow, and produce more light than the current orange sodium lights using a fraction of the electricity. The update will avoid using public capital, as the savings in energy will shoulder the cost of the project. But before you drop your Italian beef and jump on your soapbox, consider the widespread benefits of employing LED lighting. 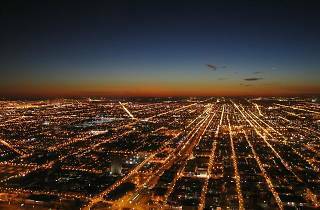 A 2011 study from the University of Colorado found that Chicago has the most light pollution of any city in the world—a distinction that locals shouldn't exactly brag about, considering that light pollution has been proven to contribute to ozone breakdown. Switching to LED bulbs ought to go a long way toward fixing that problem. On top of that, the project would allow for the city to bring a much-needed update to its lighting electricity grid and fiber optic network, both of which are grossly out of date. The city had its orange since the 1970s when Mayor Richard J. Daley rolled out sodium bulbs to light up the city and save money. In the four decades since, upgrades in lighting technology such as LED have made the old lamps obsolete. In 2011, federal funding allowed the city to convert street lights along Western Avenue and Lake Shore Drive to LED bulbs, which paid off in increased energy efficiency without showing any negative effects on the surrounding community. Greater nighttime visibility has also been found to improve safety, according to a press release from the city. So get ready, Chicago, because you're about to shine a little brighter. Its now August 2018, and I can barely see two stars in the sky over Chicago at 3:00 am, thanks to the new great and powerful blessed LED street lights. ... Why not just cut down all the trees, and burn all the grass while they're at it. The city put Ceramic Metal Halide (CMH) lighting on Lake Shore Dr. and Western Ave. not LED. The new LED lamp in my alley is so bright it's blinding. These lamps will not lower light pollution but greatly increase it. They are very annoying. I like nighttime as well as daytime. We don't need 24 hours of daytime. I should add that it might very well reduce light pollution in terms of viewing the sky since the lights only shine down. But street wise, it will increase it. They just installed one as replacement for a broken light on my street and let me tell you,it is way too bright! Yes,the color is much better than that orange but why couldn't the city choose dimmer bulbs like the suburbs? Trust me when I say it will not reduce light pollution. Say goodbye to night-time. Actually, the whiter light of LED bulbs is going to make light pollution worse. Unless cities decide to use bulbs that give off warmer light. with a color temperature of around 3000.